Think of bright colors and flowers as the starting point for your spring wedding idea. The snow is melting (hopefully), flowers are starting to bloom and the air is fresh with the promise of longer days. A great time for a wedding! Depending on where you live, Spring can be a tricky time when trying to predict the weather. If you have it too early in the season, you run the risk of getting a cold day or possibly even snow (yikes!). Listed below are some spring wedding ideas to help you with your wedding planning. There is a lot of information here, so you may want to bookmark this page so you can easily return in the future. For a spring wedding idea, think about having your wedding outside in a tent or at a location that has colorful gardens and scenery. If you are thinking about having your ceremony or part or all of your reception outdoors, have a backup plan in place for rain. If you or someone you know has a large backyard, consider having your wedding there. Even if the backyard has an in the ground pool, you can still put flooring over it and having your wedding there. Other seasonal options include local parks and arboretums, gazebos and bed and breakfasts that have gardens. You can have the ceremony outdoors in the garden or park, and the reception in a tent or inside a bed and breakfast or other location. There are also many historic sites that offer the perfect backdrop for a spring wedding. Invitations decorated with beautiful spring flowers are a great way to kick off your wedding. Daisy wedding invitations offer a nice spring touch, and many on companies offer a large selection of floral invitations for the spring season. For more ideas visit our wedding invitation guide. If you are anticipating a hot day consider giving your guests fan wedding programs. They will keep them cool as well as give them important information about your ceremony. You can also match your wedding programs with your invitations and the rest of your theme that can be based around flowers or spring colors. Garden wedding themes can be a lot of fun. Visit garden wedding ideas to see our complete guide. Options for spring flower themes include Gerber Daisies, Daffodils, Dogwood, Hyacinth, Lilly of the Valley and Sweet Pea among others. 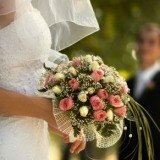 Visit Spring Wedding Flowers to see some examples. Tie the chosen flower into all aspects of your wedding, starting with your invitations. For a Gerber Daisy wedding, have your bridesmaids carry bouquets with multi-colored Gerber Daisies. Scatter petals of your chosen flower down the aisle. Centerpiece ideas include having fishbowls filled with water containing Daisies without stems floating in them. If you are having long family-style tables at the reception you can have small fish bowls down the center of the tables. Tie ribbon around each one and connect each fish bowl with the ribbon. 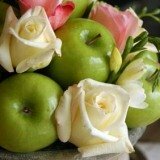 There are many great choices when it comes to flowers for a spring wedding. Try matching them to your wedding colors, like pink, purple or blue. Visit our spring wedding flowers guide for more ideas. A popular option for a spring wedding is to decorate your cake with flowers. Work with you florist to come up with flowers that accent your cake and match the rest of your wedding reception decorations. You may also want to add a wedding cake topper in addition to the flowers or by itself atop your cake. Seed packet wedding favors are a fun favor for your guests as well. Visit our guide on wedding favors for more tips and hints. A signature drink should be a part of any wedding in our opinion, and spring weddings are no exception. There is almost no limit to the concoctions that you can come up with for a warm weather wedding. Visit wedding signature drinks for some ideas to get you started, and don't forget that you should do a thorough taste test before making your selection.